JMF Disco offers an experienced Wedding DJ in Bexley to help with your special day. 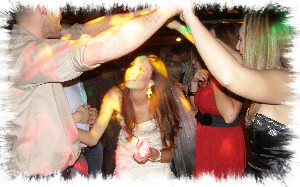 JMF Disco is owned and presented by DJ John Padmore, a reliable, experienced Wedding DJ in Bexley. My aim is to provide you with all the help you need, from your initial phone call to seeing your happy guests leaving after a wonderful nights entertainment, at your perfect reception provided by your Wedding DJ Bexley. Call or email JMF Disco for your Wedding DJ Bexley to find out how I can help you. Have a look at the Weddings page for more details of the Wedding DJ Bexley service I offer and call me to discuss how I can help make your evening very special. As well as great wedding entertainment in the evening, we can also entertain your guests with out wedding breakfast background music service, including the provision of a wireless microphone for your wedding speeches, so that every can clearly hear what advice and anecdotes are being shared. Contact Wedding DJ Bexley on Tel 01795 429777, Mobile 07895 546183 or by email to discuss your Wedding DJ needs or questions. We also provide great wedding DJs and wedding discos at some of the best local venues in the surrounding areas and villages including: Albany Park, Barnehurst, Barnes Cray, Belvedere, Bexleyheath, Blackfen, Crayford, Danson Park, East Wickham, Erith, Falconwood, Foots Cray, Lamorbey, North Cray, Sidcup, Slade Green, Thamesmead and Welling. - I'm sure I can provide you with the wedding reception in Bexley you really want!